With the gasoline engine switched off, this new hybrid sedan can drive at speeds up to 87 mph. Soon after the reveal of the flagship LS 500 sedan at the Detroit Auto Show, Lexus has revealed the new hybrid LS 500h variant at the Geneva Motor Show. Powered by the manufacturer’s latest Multi Stage Hybrid System, the new powertrain combines a 3.5-liter V6 gasoline engine with two electric motors to produce 354 horsepower, giving it a power output that’s identical to the LC 500h coupe equivalent. Built on the new Lexus Global Architecture, the LS 500h has a lower center of gravity and optimum weight distribution. This improves the stability and handling agility, while a stiffer chassis allows the new multi-link suspension to achieve enhanced handling and supreme comfort. One of the main attributes of the hybrid sedan is the four-stage shifting device fitted to the Lexus LS 500h’s powertrain, which provides a more direct response to driver inputs while retaining the smoothness and efficiency you would expect from a hybrid Lexus. 0-62 mph takes 5.4 seconds, which is slightly slower than the LC 500h. It’s also capable of driving at speeds up to 87 mph at lower revs with the gasoline engine switched off, making it an ideal car for high speed cruising. Despite the transmission only having four speeds, Lexus says the simulated shift control pattern gives it the feel of the 10-speed automatic transmission found in the 3.5-liter, twin-turbo V6 Lexus LS 500, delivering “linear, direct and continuous acceleration“ free from the “rubber band” effect in some continuously variable transmissions. As with conventional automatics, the Lexus LS 500h features artificial intelligence shift control, which automatically shifts into the optimum gear depending on the driving conditions and driver inputs. The lithium-ion battery pack is also 20 percent smaller than the nickel-hydride unit in the current LS 600h, but has a higher power density. Using lithium-ion technology has also made it lighter, thus reducing the car’s overall weight while improving fuel economy, emissions performance and handling balance. While the LS 500h may not be as easy on the eye as its coupe counterpart, the same can’t be said for the sumptuous interior inspired by Japanese hospitality. The luxurious front and rear seats have multiple power adjustments, along with heating, cooling, and massage functions. The rear seats also have an optional extending leg ottoman for generous legroom, and a 12.3-inch infotainment system dominates the dash. The Japanese culture theme continues with the trim options featuring natural woodwork and laser cutting technologies, with a choice of Art Wood/Organic, Art Wood/Herringbone and Laser Cut Special. Also included is the latest Safety System+ pack featuring numerous safety assists such as an intuitive pedestrian detection function with active steering – a world first, according to Lexus. 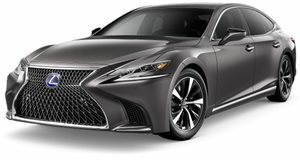 Prices haven’t been announced, but expect the Lexus LS 500h to arrive in the US towards the end of the year.